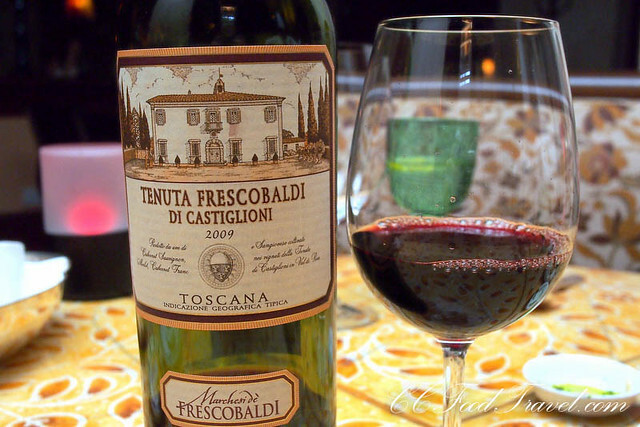 If you’re wondering why the name Frescobaldi sounds familiar it’s because it is a famous Tuscan Vineyard. 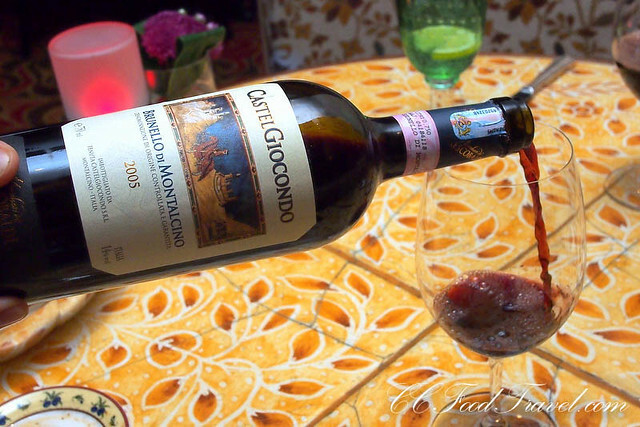 With a wine history of 700 years, the Frescobaldi family lineage of thirty generations is nothing to scoff at. The start of such passion is said to have begun in the year of 1300. 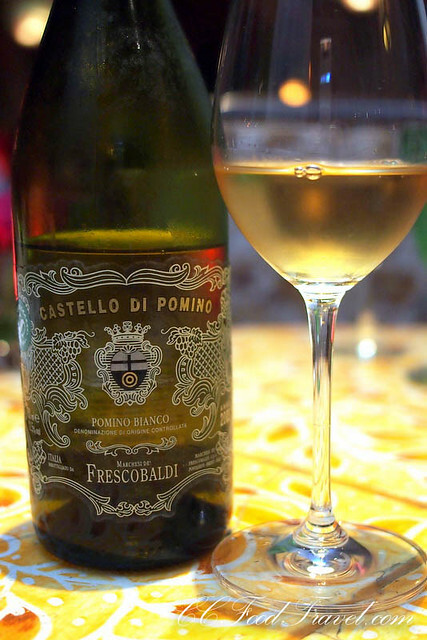 At Pomino in 1894, the Frescobaldi’s built the first Italian gravity-fed wine cellars and distinguished themselves for their specialized vineyards. Today, they have over 1,000 hectares of estate vineyard with 5 states in Tuscany, and a quality distribution network in over 65 countries worldwide. So, here we are at the Frescobaldi Wine dinner at Villa Danieli, Sheraton Imperial KL. The restaurant looks like a rustic trattoria, styled after a country home and you can picture, lots of enthusiastic feasting, and hearty enjoyment of great food and fine wines, going on here. For this Wine-Food pairing dinner, Chef Rajesh Kanna, Director of Culinary, Restaurant & Bar, came up with a pretty interesting menu and we couldn’t wait to get started. 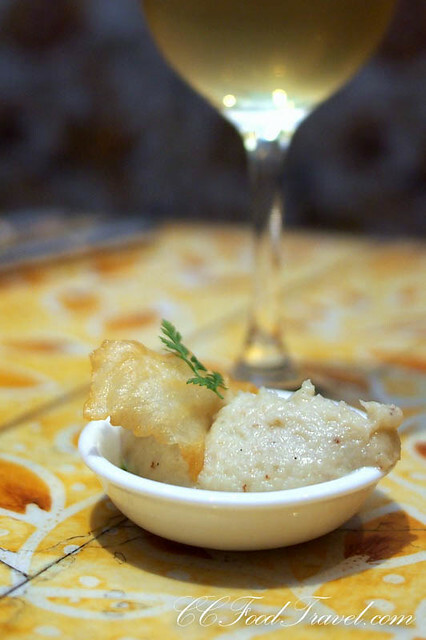 Without much fanfare, the amuse bouche was served – a Creamed Cod and Cauliflower Mash with Crispy Salted Cod Chips, paired with the Albizzia Chardonnay di Toscana IGT 2010. We found this an unusual pair actually, because the wine, enhanced the fishy taste of the salted cod chips. The amuse bouche alone was pretty tasty – we would probably have preferred it to have been paired with something like a Pinot Grigio instead. Up next, a lovely duo – a platter of Rosemary Smoked Salmon and Beetroot Mille-feuille, ash sauce and sour cream; Burrata with extra virgin olive oil mousse, mediterranean vegetables and Seared Tuna. This was paired with the Pomino Bianco (Chardonnay & Pinot Bianco) 2011. The exquisite freshness of the seared tuna, the titillating flavors of the creamy burrata and the earthy minerality of the beetroot all worked harmoniously with this wine. I was loving every mouthful of it. 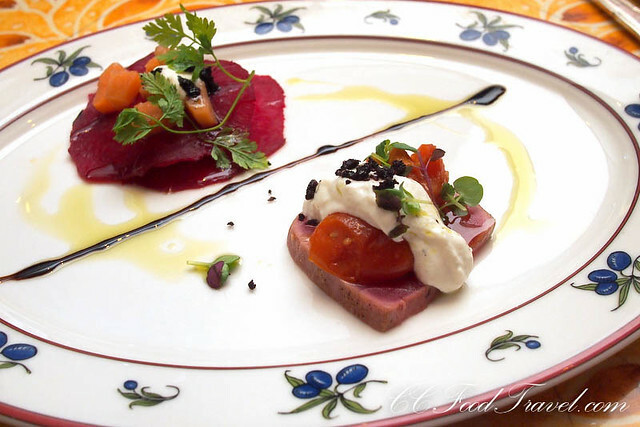 The Pomino Bianco was delicate and earthy and really complemented the tuna and beetroot. It had a refreshing, long-lingering finish which was delicious indeed! Then for the bold, there is the Goat Cheese Fondue pasta! 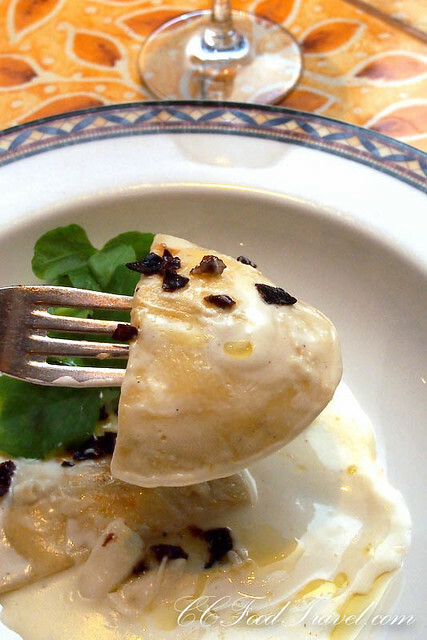 If you are not inclined towards strong goats cheese, you will probably not take to this dish very well. 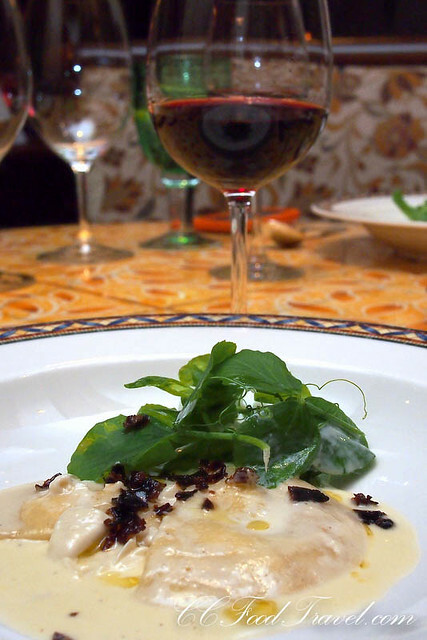 The next dish of Mascarpone Ravioli served with a Light Pepper Goat Cheese Fondue and crispy cured beef ham, was paired with the Tenuta di Castiglioni IGT 2009. We were told that the soil of the Castiglioni estate is located southwest of Florence on gentle hills, and is characterized by a mixture of sand, clay and limestone. The wine is very much characterized by the land, and has great fruit flavors, with a long lasting finish and a richness that tempered the gaminess of this pasta dish rather well. A good match we felt. 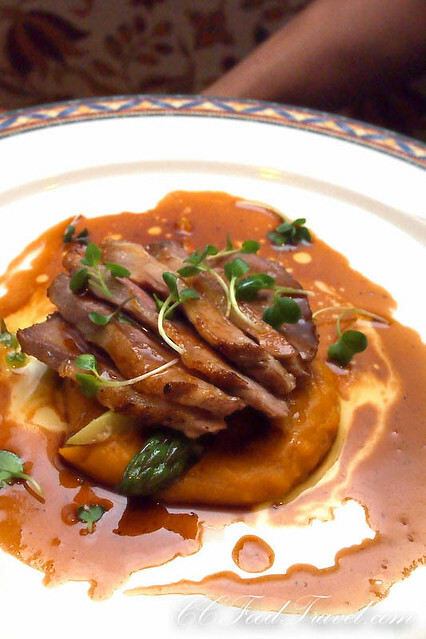 Finally, and I was really waiting to get jiggy with this rump.. a Pan Roasted Marinated Lamb Rump, Thyme Pumpkin Puree with Saute Asparagus and Citrus Glazed Lamb Jus paired with my favorite wine of the night, the Castelgiocondo Brunello di Montalcino DOCG 2005. This was a truly fascinating wine. Even without the food pair, I was in love. It had a gorgeous nose of ripe berries and plum. Definitely full bodied, with a solid core of of dark fruits. Dense and integrated tannins on the finish. So long and fascinating! The lamb had a nice sliver of fat on the side – some might say too fatty, but I finished mine. Loved they way the Thyme Pumpkin Puree and the citrus glaze on the lamb balanced each other out, and enhanced the medium rare lamb so well. Each mouthful was a definitely heightened but the bold, red wine of choice for the night. Compliments to Frescobaldi for doing such a fine job on the wine-food pairing. For dessert we had Pears and Custard Cream sable pie served with half a frozen yoghurt mousse, paired with the Illyquore coffee Liqueur. A lovely end to the night. Priced at RM220++ per person, this special four-course set meal with pairing of Frescobaldi wines will only be available for dinner from 4 to 31 October 2013. Oooh! The ravioli looks super rich! Burrata and beetroot yum, what a lovely combo! The Creamed Cod and Cauliflower Mash was so comforting! Loved the ravioli too! Castelgiocondo Brunello di Montalcino DOCG 2005 is also my fave wine but I preferred to let it decant a couple of minutes. Looks like a great pairing… bummer i had to skip this, hehe! 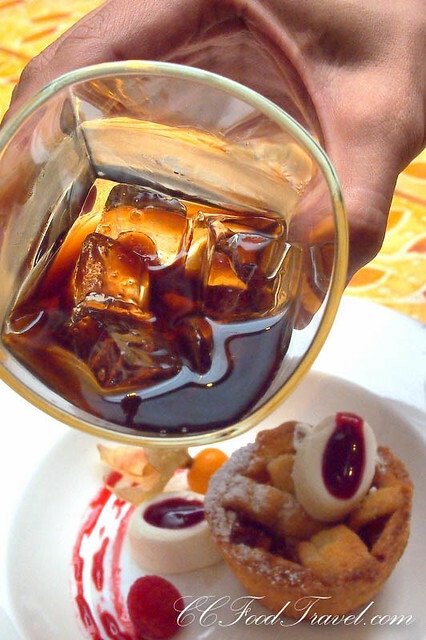 Sounds quite okay hor, for a wine pairing dinner at RM220++. is it worth it though? PM me the reply, haha. again, howww does one score invites to all these ladidah events?